Event is a new content type that is overridden from Joomla com_content with a lot of custom fields that an Event should have such as: event time, map, speaker, sponsor, ticket, etc. The category is Joomla category, go to Content > Category Manager > Add new category. 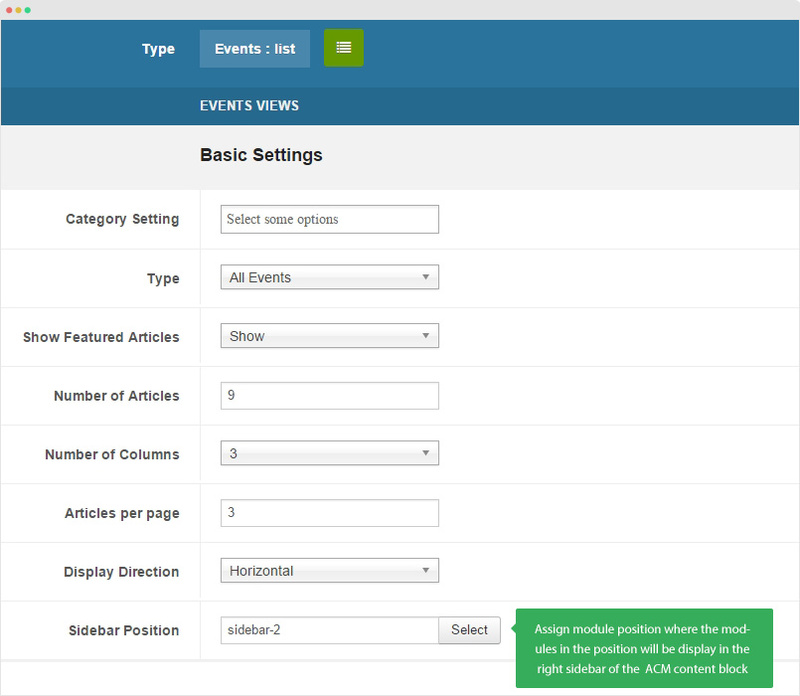 From back-end, go to: Content > Article Manager, hit the Add New button then select Event in the dropdown. An Event includes 2 main section: Event description and Event info (Address, map, logo, sponsor, speaker, etc). In the Event editing page, we have 2 corresponding setting panel: Event Info and Content. JA Teline V includes many content type, so to find the item you want, you can use the Type Filtering feature. Open the Search Tool then select the Content type. The Event template style has some different configuration, we suggest to create new template style instead of using the "JA Teline V - Default" template style. Step 1 - Create "JA Teline V - Event" template style. The best way to create a new template style is duplicating the "JA Teline V - Default" template style. Tick on the "JA Teline V - Default" then hit the duplicate button. Step 2 - Configure layout for the template style. Open the "Layout" tab, assign "event" layout. Go to Menu > Top Navigation, create new menu item then configure as our instruction below. 1. 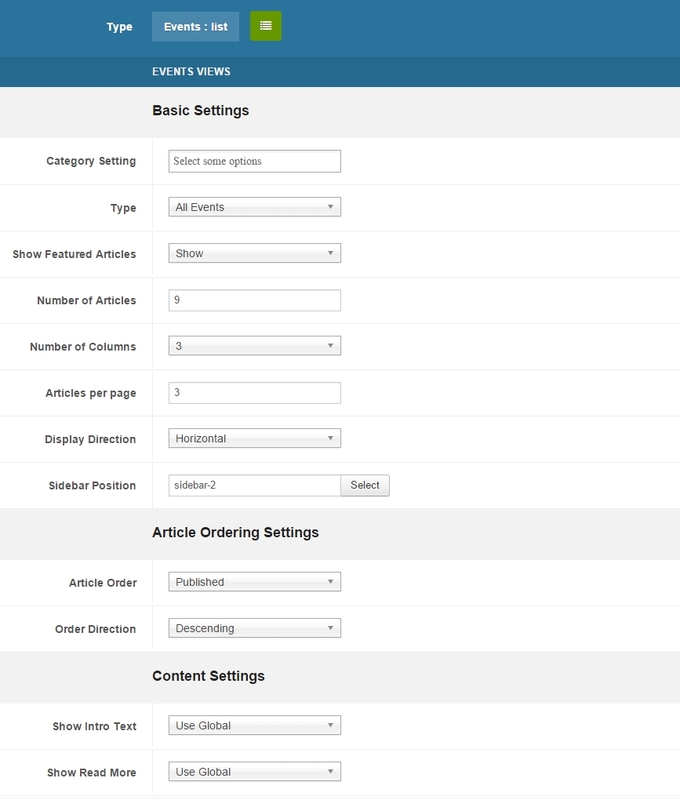 Details Settings - select "Articles > Special page: Blank Content" menu type, select category then assign JA Teline V - Event template style. 2. 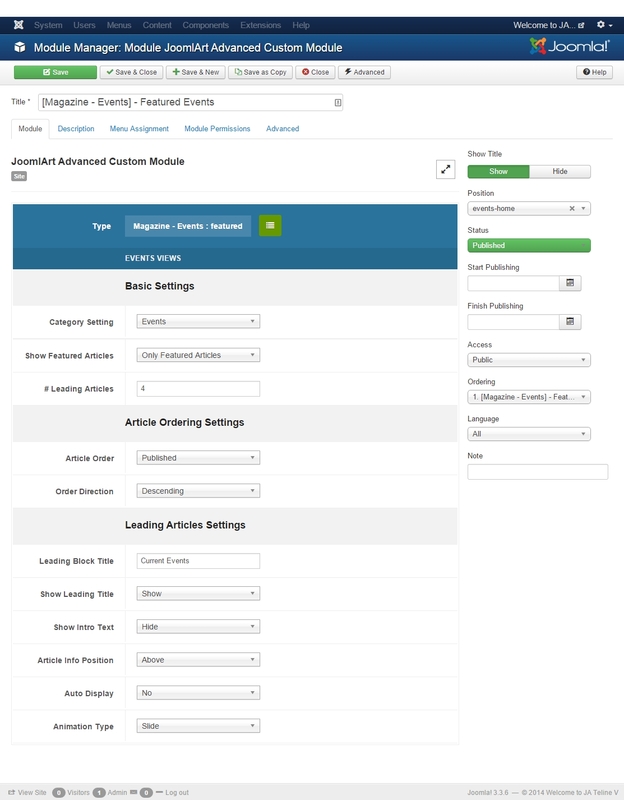 Position Settings - Select the position where the modules from the position will be displayed in the main content section of the menu as the "Articles > Special page: Blank Content" menu type does not include the com_content position. 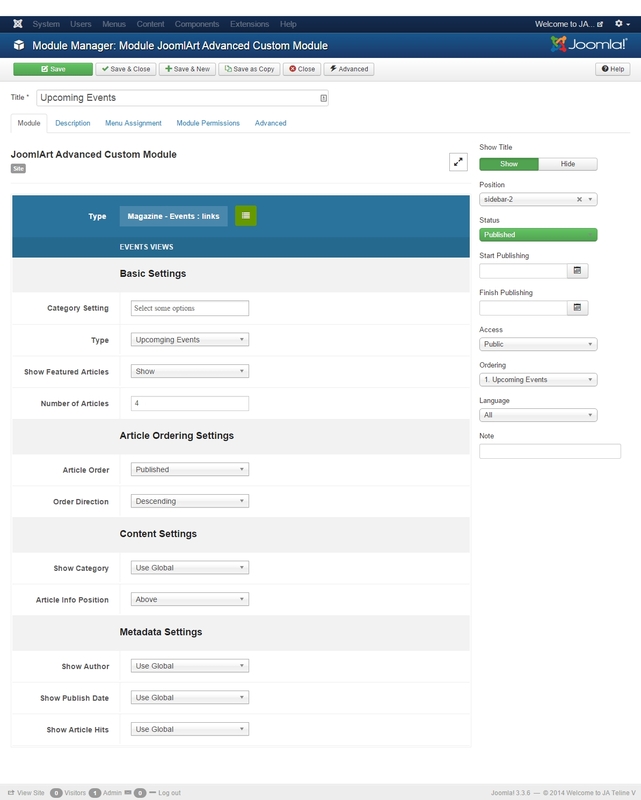 We will guide you how to create content and assign to the page as JA Teline V demo in the Assign content to the Magazine page section, just after the section. 3. 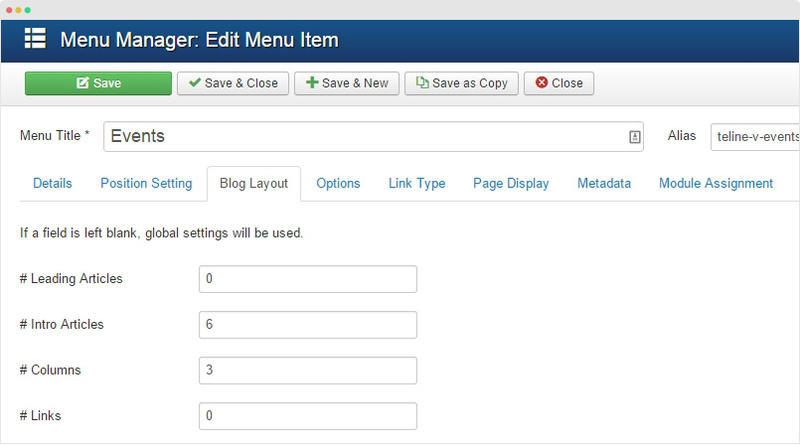 Blog Layout Settings - the setting is to configure for the display of category assigned in the menu. The content block shows featured events (in slider), each event has an event image, title and info . You can use the Advanced option, add the following demo data to quickly replicate the settings of ACM. The module is to display list of current events. In Event page of JA Telinve V demo site, we use image background for the page. #1: Replace image - you can change the background image by replace the templates\ja_teline_v\images\ev-bg.png with your image. The size for the image should be 1600 x 900 (px). #2: Replace image path - open the file then find the following and replace with the path to your own one.